Help to transform lives this year by joining our team at the Royal Parks Foundation Half Marathon 2019! The event starts and finishes in the stunning Hyde Park, taking in a 13.1 mile route through the spectacular sites of central London and four of the beautiful Royal Parks. We will be there on the day, along with thousands of spectators who join in to cheer on friends and family. Registration is £25 and we ask that you raise a minimum of £400 for the charity. 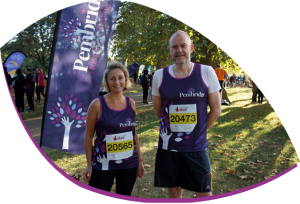 We will support you every step of the way and give you a beautiful Pembridge running top! You can also try and secure a spot via the public ballot, which runs from 29 January – 6 February. I am a Pembridge patient Pembridge are currently caring for my family member/friend I am running in memory of someone cared for by Pembridge I work at Pembridge I want to support my local hospice This will be a personal challenge Someone roped me into it! Your support helps our patients and families to live their lives to the fullest. We would like to keep in touch with updates on how you are helping and opportunities to take part in similar events in the future. Please let us know if you are happy to hear from us again. Have you run an event like this before? Have you taken part in the Royal Parks Half Marathon before or fundraised through another event before? If so, please tell us what you raised and how you did it.